The first review article that I have written (with Paola Ayala and Thomas Pichler) has just come out in the Beilstein Journal of Nanotechnology (CC-BY open access). The purpose of review articles is to summarize – to the best of one's abilities – the current best understanding of a topic. While previous experimental work by the author can be cited in the review, it doesn't contain any original research. However, conclusions may (and should) be drawn from the literature, and directions for further research suggested. 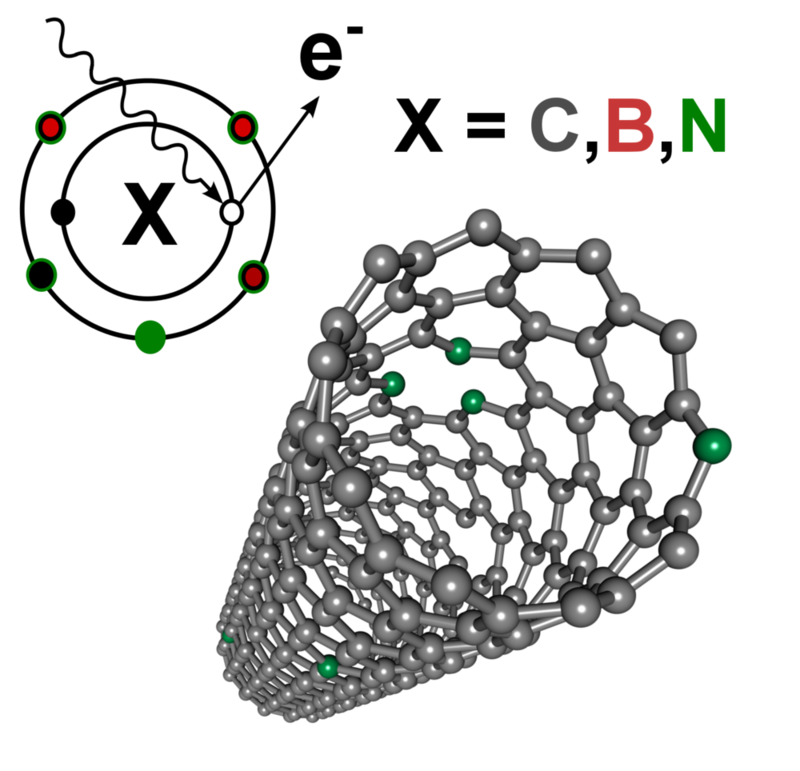 The topic of the review was rather broad, namely x-ray photoelectron spectroscopy (a very widely used experimental technique for studying the composition and electronic structure of materials) of graphitic carbon nanomaterials (that is, graphite, graphene, carbon nanotubes and fullerenes) doped with heteroatoms (meaning that some of the carbon atoms have been intentionally replaced with other elements such as boron and nitrogen). There are many hundreds of works published on this topic, so a systematic review was out of the question, and indeed would not had been so useful. Instead, we attempted to provide a useful reference to the technique, its theoretical background, and to highlight the works that we feel to be the most representative and most informative in the literature. That being said, despite citing 200 articles, we most certainly missed many deserving studies – so my sincere apologies to anyone who was left out! X-ray photoelectron spectroscopy (XPS) is one of the best tools for studying the chemical modification of surfaces, and in particular the distribution and bonding of heteroatom dopants in carbon nanomaterials such as graphene and carbon nanotubes. Although these materials have superb intrinsic properties, these often need to be modified in a controlled way for specific applications. Towards this aim, the most studied dopants are neighbors to carbon in the periodic table, nitrogen and boron, with phosphorus starting to emerge as an interesting new alternative. Hundreds of studies have used XPS for analyzing the concentration and bonding of dopants in various materials. Although the majority of works has concentrated on nitrogen, important work is still ongoing to identify its precise atomic bonding configurations. In general, care should be taken in the preparation of a suitable sample, consideration of the intrinsic photoemission response of the material in question, and the appropriate spectral analysis. If this is not the case, incorrect conclusions can easily be drawn, especially in the assignment of measured binding energies into specific atomic configurations. Starting from the characteristics of pristine materials, this review provides a practical guide for interpreting X-ray photoelectron spectra of doped graphitic carbon nanomaterials, and a reference for their binding energies that are vital for compositional analysis via XPS. The article is free to read on the website of the journal. Any feedback or tips about interesting studies we might have missed are most welcome!